This education kit was produced for the Wynne Prize 2015 and presents children's labels from the exhibition along with questions and activities for students in K-12. 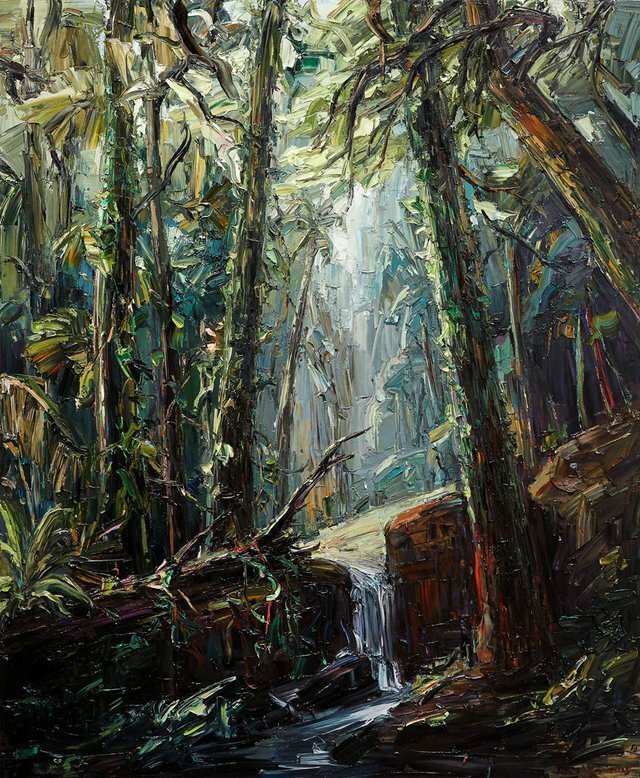 Jun Chen has painted a scene of the Kuranda rainforest near Cairns in Queensland. He has used thickly applied paint to emphasise the lushness of the forest. Light filters through the trees and flecks of white paint add to the watery, moist atmosphere. What sounds might you hear if you stepped into this forest? Identify the painterly techniques Jun Chen has used to create the illusion of depth in the rainforest. Find images of a natural environment that appeals to you and identify key features of the landscape. Develop a series of acrylic paintings based on this environment. Consider the colour scheme that would best communicate the essence of the landscape. 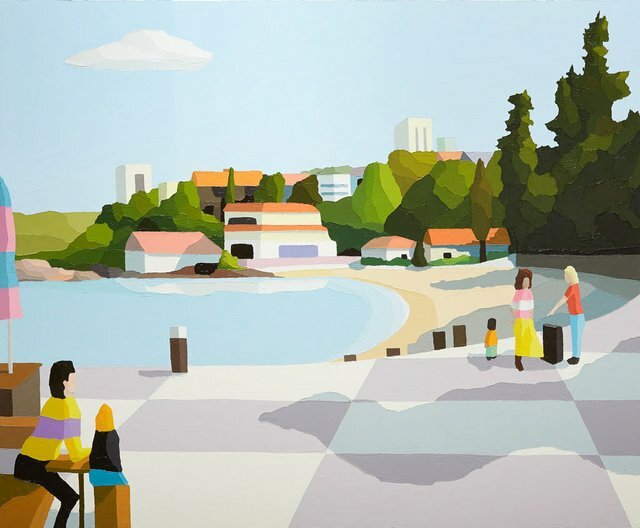 Michael Muir has used simple shapes and flat colour to depict buildings, trees and people at a beachside suburb of Sydney. Shadows in the foreground create a pattern on the boardwalk which leads our eyes round the curve of the bay. Imagine what it would be like to stroll along this this beachside location. Describe the experience, inspired by what you see in this painting. Invent an advertising slogan to accompany this painting to promote the benefits of getting out and about by the beach. Include speech bubbles for the figures in the composition. Create a painting of your own local environment in a similar style, taking inspiration from Michael Muir's approach to colour and form. Do you think this landscape looks real or imagined? 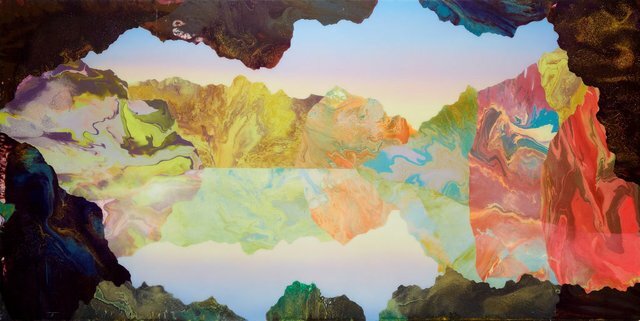 Artist Kate Shaw was inspired to paint this dream-like landscape after she saw some plastic litter fused to rocks on a beach at Phillip Island. Plastic takes thousands of years to break down so human activities can have a dramatic effect on the environment. The chemical-like colours of the rocks in this landscape perhaps act as a warning for the Earth’s future. Describe this landscape. List the colours you can see. Survey the surface qualities of the painting. In class, experiment with marbling techniques and discuss your results. 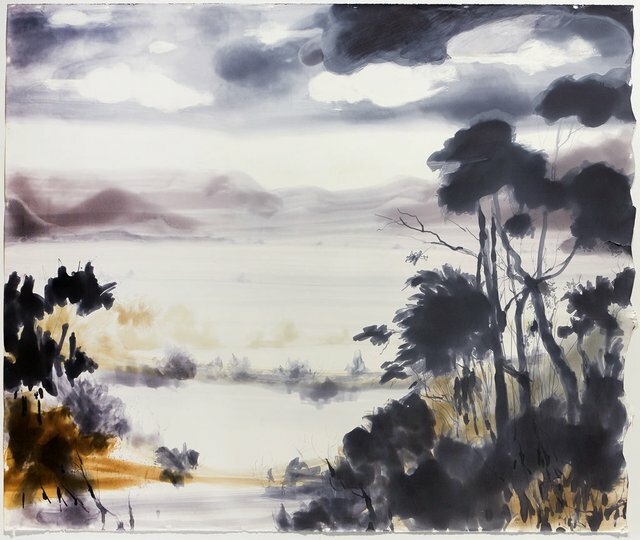 How has Kate Shaw suggested the dramatic human impact on the environment in this image? How does this painting make you feel about the future? Create a marketing campaign to encourage consumers to reduce the use of plastic and to recycle more efficiently. To illustrate your campaign, draw or paint images that show the effect rubbish has on the environment. Look at the fine lines and patterns in this painting. Pintupi artist George Tjungurrayi has painted patterns and designs that relate to a small plant called Mungilpa that grows in the claypan areas of his country in the Western desert of Australia. The black seeds of the plant are used to make damper, a type of bread cooked in the ashes of a fire. 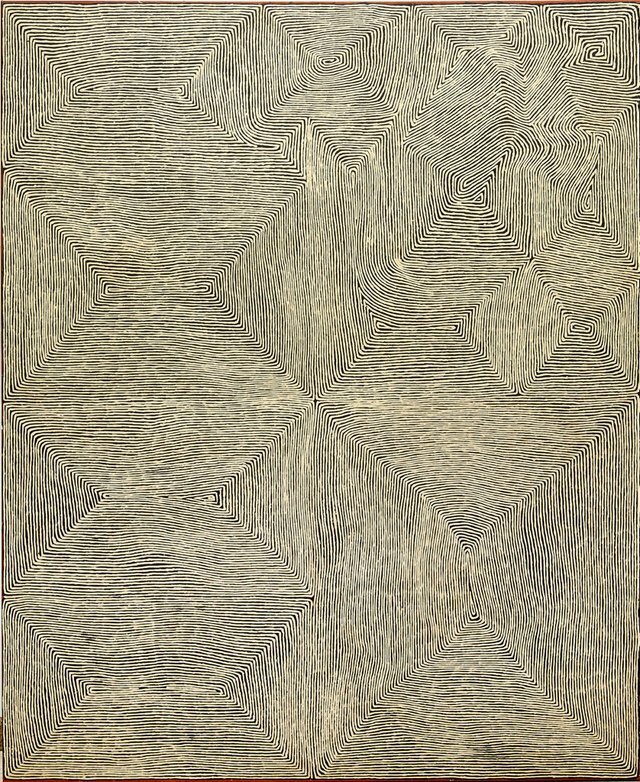 Notice how the lines in this painting shimmer and vibrate. Imagine the process of creating this painting. Where do you think the artist started? Why do you think George Tjungurrayi has used such a limited range of colours? Invent a design to represent a plant in your local area. Investigate the shape of its foliage, flowers or seeds. Consider your use of colour and repetition. Karl de Waal has created nine little scenes, each one an individual landscape with characters and trees sitting on bricks. Karl invites us to imagine what could be happening in each scene. The knobs at the foot of each brick are like channel-changing knobs on old TVs that we might turn to see different stories unfold. Make up your own stories for each scene. What is an 'assemblage'? Identify the materials the artist has used in this work. Read the artist statement and discuss the ideas Karl de Waal is exploring through these miniature landscapes. Create an assemblage of your own. First, plan your sculpture by drawing a detailed design and listing the materials you will need. Then collect the materials, create the work, give it a title and display it in class. Have you ever noticed the sky change as a storm approaches? This watercolour painting by Susan J White captures the dramatic lead up to a storm. Notice how the silhouettes of the trees and the feathery brush marks create the illusion of movement. Thin washes of paint create a mirage in the distance. How would you paint this scene once the rain of the storm has started to pour? Identify what you can see in the foreground, middle ground and background of this painting. Observe the various watercolour marks and areas left free from pigment across the surface of this large sheet of paper. How physical do you think it was for Susan J White to create this image? Research Lake George and find out why it has attracted people's interest, from artists to birdwatchers and historians.